-The RFBA provides a death benefit for all members in good standing. The current benefit is $17,500. It was recently increased from $15,000. -Both active and retired RFBA members pay dues. Members with fewer than 25 years pay $10/month and members with more than 25 years pay $2/month. Dues typically pay for things like office rent, office supplies, monthly meetings, bibles, florist expenses, officer salaries, retiree functions, and the Holy Childhood Christmas party. The board also occasionally votes to use dues for expenses related to the trust fund, such as legal and accounting fees. This takes some of the burden off the trust, allowing it to grow larger, which then allows for future death benefit increases. -The RFBA organizes and funds traditional events every year: The Holy Childhood Christmas party dates back to the 1960s, young children of deceased members receive monetary gifts at Christmas, and the Firefighters’ Ball was resurrected in 2009. The RFBA also funds a retiree picnic every summer and pays toward yearly shift calendars for retired members. 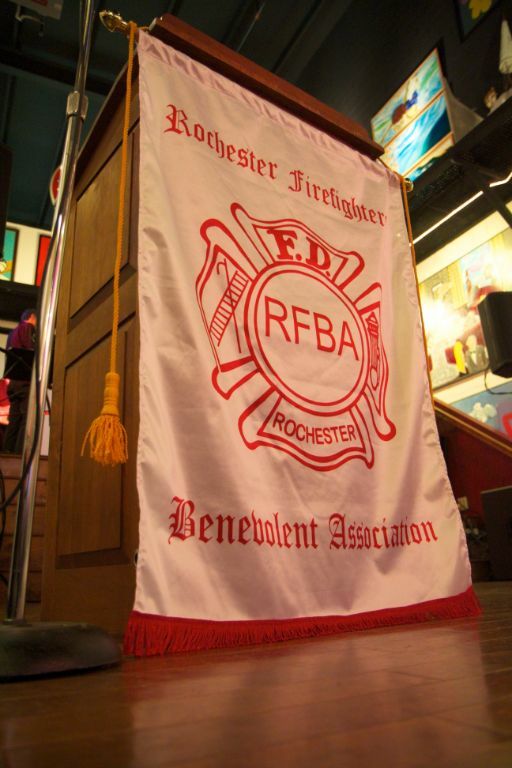 -The RFBA administers the DeRoberts Fund, which is sustained by investment interest on the original $25,000 principle donated to the RFBA many years ago by the estate of Ruth DeRoberts, daughter of former Fire Chief Josiah Kinsey. Interest derived from the DeRoberts Fund pays for maintenance of grave sites of our fallen members at Mount Hope Cemetery. This includes headstone cleaning and repairs and general upkeep of the large firefighter monument at the center of the firefighters’ plot. -The RFBA administers the Fallen Firefighters Fund, which pays for maintenance of the Fallen Firefighters monument in front of the Public Safety Building. Responsibility for this fund was taken over by the RFBA several years ago at the request of the RFD personnel who were initially assigned the task of designing and placing the monument at its current location.